Ever since my teenage years, I have been going on and off different diets. I come from a stocky build family and have always struggled with my weight. My best weight loss took place several months before my wedding. I bought a wedding dress online and didn't realize that wedding dresses are sized differently and when my dress came in, it was too small in some areas. I was devastated and because I couldn't return the dress (they claimed it was specially made for me, which was baloney) I was forced to lose weight. I went on a pretty strict diet and ended up losing the weight I needed to fit into my dress. Total weight lost for that was about 25 pounds...which I lost in two months. Oh man. I don't EVER want to have to go through that again! It was so hard but because I was successful, I know I have the will power and ability to lose weight. Now, I find myself on a diet once again simply because after having my babies, the weight isn't coming off easily and I want to look and feel better. Weight loss is not something to sneeze at...it's serious business and something that most people are trying to accomplish. 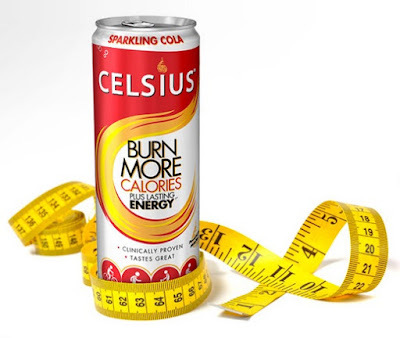 Celsius, the world’s first negative calorie drink, was developed by a dedicated team of experts united by a strong commitment to true science. Celsius launched in June 2005 after completing a clinical study validating its calorie burning benefits. In a 10-week clinical study published in the Journal of International Society of Sports Nutrition, with sedentary men and women, the group who drank one Celsius per day experienced 93% greater fat loss. I have tried different types of energy drinks before but nothing like this. 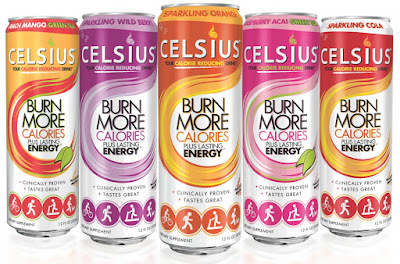 You can imagine my excitement when Celsius contacted me about conducting a review of their beverages. So, for this review I was sent four cans of Celsius to try! 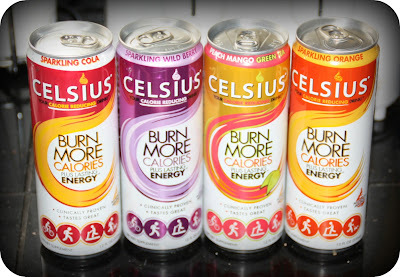 Currently, Celsius is offered in 5 delicious flavors and I was sent four of them. I was sent Sparkling Orange, Sparkling Cola, Sparkling Wild Berry and the non-carbonated Peach Mango Green Tea. I have been working out on an exercise bike and try to do so daily. Today, I enjoyed a great workout on my bike and afterwards, I decided to try out Celsius. It was so hard to decide which flavor I wanted to try but finally settled on the Sparkling Cola. Each serving (which equals one can) does contain 200 mg of caffeine, which I wasn't thrilled about but decided that I will just try it out and see how I feel. I am also breastfeeding my 11 month old and was nervous about how it would effect her as I typically try to stay away from caffeine. I love the idea that this is a sugar free energy drink though! Also, there is no Aspartame either...that is scary stuff and so I am relieved to see that it isn't found in Celsius. The flavor of the Sparkling Cola tastes just like soda pop! Each of my children had a SIP and they all loved it. If it wasn't for the caffeine, I would have let them have more than a sip but I didn't want them bouncing off the walls. LOL! I found that after I drank a can of Celsius that I didn't feel "buzzy" like I do when drinking a large cup of coffee. I feel that there is enough good stuff in this (Green Tea with EGCG, Ginger, Calcium, Chromium, Guarana and Vitamins B & C) to counteract the negative effect that caffeine can cause. 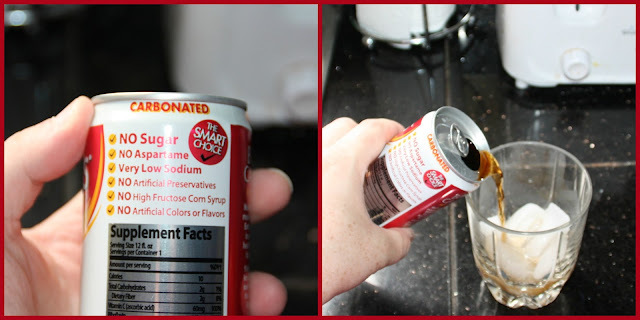 I felt more energized and was able to tackle alot of small cleaning projects around my house as well. It felt amazing to be able to get things done and stay focused at the same time. So if you are looking to boost your weight loss or just to stay energized and healthy, Celsius can help you to accomplish that! 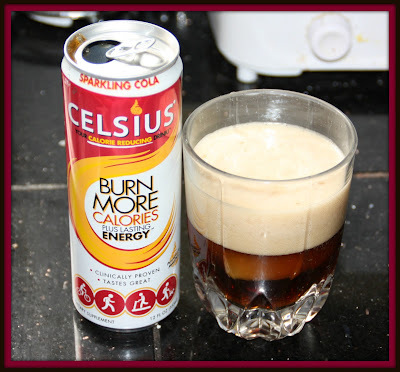 I love all the benefits of Celsius and have really been enjoying it. To purchase Celsius, you can check out the store locator for stores around you. I can find Celsius at local GNC stores as well as on Amazon. So, be sure to visit them today and also, visit them on Facebook and on Twitter to keep up with all the fun and excitement that happens there. Celsius can help you accomplish your fitness and wellness goals so learn more today and enjoy living on the healthier side of things!